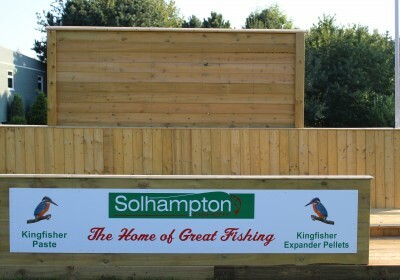 At Solhampton Fishery we offer superb match, festival and day fishing. Our pools host some of the best pool fishing within the West Midlands and UK. We are based just outside Stourport-on-severn, approximately 4 miles from Kidderminster, set away in an idyllic part of the Worcestershire countryside. We have seven fishing pools at Solhampton Fishery, they are home to six species of fish from Carp up to 25lbs, big Tench, Rudd, Roach, Ide and Bream. All of our seven pools at Solhampton Fishery are kept to a high standard throughout the year. We are open all year round and we also host evening matches during the summer months. These are always a popular fixture among the fisherman, so book early! Our pools have all been designed to enhance and take advantage of the natural surrounding. We have over 190 pegs, which is ideal for large match day fishing events and festivals. We cater for corporate and private clients, our onsite café is always a great meeting point were we can cater for all appetites. We have ample parking and all pools are close to the main facilities. Solhampton Fishery is the ultimate fishing experience in Worcestershire and the West Midlands, catering for match and pleasure anglers alike. Our biggest match weight is 325lbs and we always have big back up weights.